Join us at the luxurious Radisson Hotel & Suites Sydney on 24th and 25th February for two days of intense training from five of the industry’s best. This two day workshop will be packed with valuable trading information. Whether you use MetaStock or not, you won’t want to miss this opportunity to learn from Stuart McPhee, Rahul Mohindar, Scott Brown, Kelly Clement and Gary Burton. 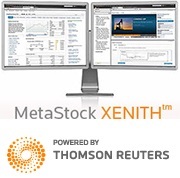 All the instructors are industry experts, and they ALL use Metastock to analyse the markets. Two full days of instruction with meals for only US$399!